Coco (2017): Aspiring musician Miguel, confronted with his family's ancestral ban on music, enters the Land of the Dead to find his great-great-grandfather, a legendary singer. Hey! This just in: when Pixar isn't busy making Cars 43, it knows how to make some good original IPs. Coco follows in the line of (sadly) exceedingly rare new Pixar IPs and is exactly what you would expect Pixar to make: a lovely animated film. While it's not quite as good as 2015's Inside Out, (the last major original Pixar film of note) and is built on a rather absurd premise to me, (a family that hates music so much if you even utter the word they lose their minds? Really?) I still had a wonderful time watching this. The score and the songs are fantastic, and the animation just keeps getting better and better. Pixar kind of goes overboard on the colors, to the point where I feel like their philosophy is "We're better than you, and we know it!" with their animation, but it's still absolutely spectacular to watch unfold. The wideshots of the City of the Dead are some of the best animated shots I have ever seen. Beyond the crazy premise, this story is very much within the Pixar fomula: fun for the whole family, a few unexpected twists and turns, and makes you rock the ugly cry by the end. But, obviously, the Pixar formula works, so why try and reinvent the wheel? There are a few absurdities (even by animation standards) in the third act, but I still had a very good time watching this. But....there's just something holding it back from greatness. The score/animation are beyond great, and I do love the culture in this feature, but.....I don't know. It just plays out almost exactly how you expect it to, and the ugly cry does feel like a cheap ugly cry when it's all said and done. Actually, I think that's it. This film does solicit an ugly cry, which is great, but that ugly cry is a cheaply earned one. That's just not Pixar's usual MO. It's obviously the highest profile American animated feature this year, but when this is the best American animation has to offer.....it caps a lackluster year for the genre, to say the least. Loving Vincent (2017): In a story depicted in oil painted animation, a young man comes to the last hometown of painter Vincent van Gogh to deliver the troubled artist's final letter and ends up investigating his final days there. Wow. Let me start by saying....this film is breathtaking to look at. The oil painting animation is absolutely stunning, and is certainly worth the price of admission. Anyone who considers themselves a fan of Vincent van Gogh or really art in GENERAL should take the time to watch this. The look of it is unlike anything I've ever seen, and the crew (it took over 100 artists to create this film) gave each frame a painstaking level of detail. I was amazed when I could recognize Saoirse Ronan and Jerome Flynn before they even started talking, and I could even see some (though it was admittedly limited) of the emotion in each individual character's face. This unique style is the reason to see this movie, which is good because the story is.......mediocre, at best. While it did have a nice ending, the journey to that felt like a 90 minute-long episode of CSI without any of the unrealistic forensic analysis scenes. The main character, Armand Roulin, (voiced by Douglas Booth) spends about 75 of the 90 minutes just interviewing other characters, and during the interviews you'd get predictable a black and white flashback (which was clearly used as a crutch for the animators) to Vincent while he was still alive. As gorgeous as this film was to look at, if this story had been told without any animation, it would probably be viewed as a pretty bad movie. Also, some of the voice acting here was...not great. I don't know if voice actors in traditional animation features have something to base their performances on while they're recording their lines, (like performing them in a room with each other) but it certainly felt like the voice actors here had absolutely nothing to go off of. This may be a limit to the oil painting animation style, but I don't know. End of the day, I have to give this film a decent score simply because of its incredibly unique style, and I still give it a STRONG recommendation, just don't expect to rewatch it again anytime soon. Unless you leave it on mute just to marvel at its beauty. The Boss Baby (2017): A suit-wearing, briefcase-carrying baby pairs up with his 7-year old brother to stop the dastardly plot of the CEO of Puppy Co.
Uggggghhhhh how was this nominated for an Academy Award? This movie is a quintessential example of everything that's wrong with modern American animation. It barely classifies as coherent. It follows rules that would make The Fountain proud. As in THERE ARE NO RULES. Its cobbled together with frantic, borderline incoherent editing to ensure the kids aren't bored. It's littered with poop/fart/barf jokes aimed at appeasing to the lowest common denominator. The animation itself isn't even all that good! As is the voice acting! Jimmy Kimmel was awful, (which kind of makes sense....who at Dreamworks thought it was a good idea to hire Disney/ABC's late night host for their movie?) and Steve Buscemi wasn't any better. It felt so weird to hear Alec Baldwin talking out of a baby, which I never got over, and Tobey Maguire is barely in this at all! Despite his major screen credit. Everyone here is in it for the paycheck, and it doesn't help that the story barely qualifies as one. Its RAPID pacing ensures the kids don't get bored, but also removes any chance of being able to digest anything that is happening on screen. There are a few cute moments, and I did laugh three or four times, but the rest of this thing is a travesty. I started putting away my laundry as it was going on, I was that bored. When an animated film has you doing actual chores to distract yourself from it....you know you done goof'd. It is almost insulting that this film received an Oscar nomination over Your Name., which is "Exhibit A" of a major problem within the Academy's Best Animated Feature category today. Now that it's outside the theater, don't bother with this....just go and show your kid Toy Story (again) instead. Your Name. (2017): Two strangers find themselves linked in a bizarre way. When a connection forms, will distance be the only thing to keep them apart? I'll admit it: anime is a foreign world to me. So take my opinion on this movie with a major grain of salt. That said, I can see why there is so much hype behind this. It is wildly original premise, and its premise is executed marvelously. There are a few moments that I couldn't really follow as the editing was a little too erratic at times, but overall I had a really good time and was (somewhat to my surprise) very engaged and engrossed in this compelling story. The ending was.....not great, though. For as unorthodox a story as this is, the ending felt very cheap and safe. And we had to get a few silly "I gotchus" in the third act along the way, too. Overall, I think this film could've been about 15 minutes shorter, with a few of those sillier moments in the third act cut down for time. I won't say much about the animation in this, as I am no expert, but I will say I liked this style of anime a lot. The colors were amazing, and some of the establishing shots made me wonder at the amazing things you can do within the anime genre nowadays. Also, this film featured a great score/original songs. I don't know any of the artists featured here, but I would assume they are all big deals now across the big pond. The music was wonderful. I don't really have much else to add here. This style is outside my own wheelhouse, but I think this should be the primary takeaway: if a guy who has barely seen any anime thought this film was great, it may very well be worth the watch. Especially if you have just a passing interest and are looking for a gateway into the genre. Wonder (2017): Based on the New York Times bestseller, WONDER tells the incredibly inspiring and heartwarming story of August Pullman, a boy with facial differences who enters fifth grade, attending a mainstream elementary school for the first time. Ok.....let me start off by saying that I like this movie. I found it to be a very enjoyable viewing experience. Owen Wilson and Julia Roberts are FANtastic, and Jacob Tremblay is as lovely as ever. But it's just so. Heavy. Handed. This movie is playing you like a fiddle, and you will know that it is, and you just have to decide whether you want to care about that or not. I choose not to care. I just.....noticed. Everything plays out exactly how you expect it to, and everyone says the exact right thing at the exact right time. To the point that it almost felt....superficial. But it's not, because Jacob Tremblay is wonderful and Owen Wilson/Julia Roberts are a great film couple. This movie made me laugh and cry exactly when it was supposed to, and I have to give it credit for drawing emotion out of me even when I knew that that's exactly what it was trying to do. The makeup is great and well deserving of its Oscar nomination. But.....idk. There's only so much you can do with a movie that's as heavy-handed as this is. Like....there's hardly even a moment in this film where any adversity is faced for Tremblay, (Auggie) and when it does happen someone is always there to say exactly the right thing to help him get through it. There are a few moments here that felt truly genuine, particularly a moment towards the end of the film with Owen Wilson and Tremblay, but a lot of it still borders on superficial. There's also these weird moments where we focus on someone that isn't Tremblay, which didn't feel all that important and thus messed with the film's pacing, but there are only a few of these. It's a decent movie, no doubt, one that will play you like a fiddle throughout its 113 minute runtime, but it doesn't offer much beyond its "uplifting" surface. Fortunately, though, a superficially "uplifting" flick is still fun. The Secret Life of Pets (2016): A terrier named Max's quiet life is upended when his owner takes in Duke, a stray whom Max instantly dislikes. Man is Illumination Entertainment trying to make themselves another Pixar or what? I'm not gonna lie I had pretty high expectations for this film. After all the previews were HILARIOUS and it's pets! How could you not love them, right? Well, after the opening of the film which showcased pretty much everything you see in the trailers, the story kicked in. And you could tell Illumination Entertainment was trying so hard to create a story worthy of Pixar levels of memorability, but sadly they fell out of the Pixar tree and hit the ground with a thud. So, first off, let's talk about what this film does right. The animation was excellent. As I said in Finding Dory, I do not feel I have the expertise to actually critique the animation, but I can tell that Illumination has a very distinct animating style (like Pixar) which was fun to watch. And that city shot of New York City was GORGEOUS. Whoever made that deserves an award just for that shot. (Which they used several times, fortunately) Also the movie definitely has some great jokes for the kids and great jokes for the adults too. Illumination definitely tried to keep the parents entertained here, which is a traditional fault of most animated films. Finally, I had no qualms with the voice acting, though it definitely was not as good as Pixar's 2016 film Finding Dory. But here's my problem. Well, one of them: the pacing. This film comes in at a short 90 minutes, (as it should) but my problem with pacing here was the film never really gave you a chance to breath. To appreciate what was going on.There were hardly any scenes with just two characters talking to each other and thus giving these characters a chance to develop. Now that's not to say that no character development took place it's just some of it wasn't really earned. My other problem with this film lies in its ties to Toy Story. As in.....this story is Toy Story. Like.....exactly Toy Story. Now this isn't a huge fault since Toy Story is a great film to be compared to but when it comes from a completely different studio? I don't know. I mean after the success of the unique Despicable Me, Dreamworks has pushed hard to make Illumination Entertainment to them as Pixar is to Disney. So to see Pixar's biggest competitor basically produce Toy Story but with pets....it kind of rubbed me the wrong way. That said, this film is still an above average film, and definitely one worth seeing if you have a family. But fans of movies like myself I think are going to be a little disappointed. Especially since the trailers made it look fantastic. (That dog jamming out to heavy metal was definitely worth the cost of admission!) Ultimately this film leaves a lot to be desired, and with several promising animated films coming up later this year I'm honestly not even sure if this will receive an Oscar nomination. Check it out! Just....temper your expectations. A lot. The Critique: Despite some major pacing problems and its striking similarity to a Pixar classic, The Secret Life of Pets is still a decent movie-watching experience. The Recommendation: Definitely fun for the whole family on a hot summer's day, but everyone else? Just Netflix it. There. I said it. Also I have to point out Illumination Entertainment's clever tribute to itself featuring a super brief cameo from Pharrell's "Happy." Well played, guys. Minions (2015): Minions Stuart, Kevin and Bob are recruited by Scarlet Overkill, a super-villain who, alongside her inventor husband Herb, hatches a plot to take over the world. So. Many. Minions. It should be noted that in a film like this, it doesn't really matter what I say. I haven't "rushed" to get this review out because if you like the minions you're going to see this film regardless of what I say. But if you're here, you might be wondering what I thought about this film. So I'll tell you! WHOA. So I had more fun that I was expecting with this film, however, this is not saying much. I had very low expectations going into it, so it wasn't difficult to pleasantly surprise me. Keep in mind, though, that this is a kids film. There are very few jokes for the older audience here. Least far fewer than there should be in a kids film that's made well over $100 million in its first weekend. Illumination Entertainment should take some lessons from Pixar of how to keep adults really entertained in a children's movie. It can be done I assure you. Look. It's very hard to get past the fact that this film and this franchise is a cash cow for Universal. From a technical standpoint, this film is very lazy. The franchise hasn't really advanced technically since the first film in 2010, and now the animation is starting to look dated. But does it matter? No. The story is....predictable. I mean I never once would buy that any of these characters would adopt the minions, much less actually think they could do any of the things they did. But does it matter? No.The voice acting was lackluster. You could tell the actors were going for charm more than anything else, but Hamm and Bullock did a nice job as the two main characters. However, everyone else was extremely forgettable. But does it matter? No. The only thing this film had to offer was an exceptional soundtrack. Not just that, but this is clearly where most of the production budget went. Jimi Hendrix, The Rolling Stones, and even The Beatles all show up in this film. I'm still on the outside looking in on this sort of thing, but even I know that it takes a ridiculous amount of money to feature a Beatles song in your film. For once, though, I wish that money had gone to creating a better story or better animation than expensive music that would play in establishing shots for a new location or something.The soundtrack, as great as it was, didn't add to the overall experience at all. It was recognizable music simply for recognizability's sake. At the end of the day this film is.....fine. Neither good nor bad. Just average. I laughed a few times throughout the 104 minute film, and found myself smiling at others, but I couldn't get past the fact that this film is around just to be a cash cow.The technical deficiencies and forgettable voice acting didn't help its case, either. Basically....if you're gonna feed the cash cow, what I say doesn't matter. If you actually are skeptical about this film....just Redbox it. The Critique: The definition of a cash cow. While somewhat enjoyable, Minions brings fans of the franchise exactly what they want to see and nothing more. The Recommendation: If you want to see it, you've already seen it. If you haven't, don't bother until it's on Netflix or Redbox. Inside Out (2015): After young Riley is uprooted from her Midwest life and moved to San Francisco, her emotions - Joy, Fear, Anger, Disgust and Sadness - conflict on how best to navigate a new city, house and school. Thank you Pixar. Thank you for once again reminding us that you are spectacular storytellers. Look. It's impossible to deny that Pixar has been on a, well, less-than-stellar tear recently. Cars 2 is pretty much universally proclaimed as the worst film in their history, with Brave and Monsters University better, but still not up to par with what we expect from the revered studio. However, this all changes with Inside Out. Easily the best film Pixar has made since 2010's Toy Story 3, Inside Out is original, funny, creative, and....well....a blast! The film is certainly not perfect, with the first act of the film far outpacing the overused two-main-characters-with-opposing-viewpoints-become-lost-and-most-unite-to-return-to-the-rest-of-the-main-characters storyline we get in the second and third acts, but this film is still an incredibly enjoyable ride. And definitely fun for the whole family. So, let's first talk about my one big complaint. I wish Pixar would have been comfortable with the premise they initially established in the first act. I definitely could have watched an entire 94 minute film about Joy, Sadness, Anger, Fear, and Disgust all in one room and trying to get along in the day-to-day life of an young girl. We could've watched the girl grow up and develop her likes and dislikes as she becomes older. For example, maybe as a child she thinks boys have cooties and avoids them, but suddenly right around her 15th birthday she takes a liking to boys and the emotion of Love is introduced and the other characters have to incorporate that emotion into their group. Maybe her parents divorce and Anger manages to take over her brain for a while and Joy has to figure out how to calm that emotion down. These stories sound vastly more interesting to me than the one we got, which was Joy and Sadness exploring her brain figuring out how to return to "central HQ." This stems from an, oddly enough, lack of confidence from Pixar to believe in the premise they created. We've seen it before from them. They probably weren't sure if they could pull off such a radical and crazy idea as this and thus took the safe route of putting a standard rescue story with two characters who are opposites together for the majority of the film. That said, I'm basically splitting hairs, as even this overused premise is executed faaaaaar better than 99% of the other times this premise has been used. So, what does this story get right? Well, basically everything else. First off, the animation is, as usual, beautiful. Pixar's style has been adopted by most because it seems easy, but it's not. Even in the trailers before this film I noticed several films adopting Pixar's style and looking TERRIBLE in the process. But Pixar is still, in my opinion, the best animation studio in the world, and I base this statement on the beauty of films like this. Joy? Joy's character design is insane. The amount of pixels on her must be astronomical to make her look beautiful as she does, especially when you're watching this film on the big screen. Her character in and of itself is a tremendous achievement for animation, not to mention the attention-to-detail on the other character models as well. The hair of Sadness in particular is spectacular. Though, a friend of mine brought up the valid complaint that every woman in Pixar's animation looks the same, which is kind of true. Look at the picture at the top and you'll see very similar facial animation models for Joy, Sadness, and Disgust, but hugely different facial animation models for Anger and Fear. Sadly, this is not a coincidence. Anyway, the score? Outstanding. Michael Giacchino, essentially Disney's go-to at this point, once again delivers a beautiful score for this film. And of course the voice acting. Everyone in this film is great. Amy Poehler and Phyllis Smith have great chemistry as Joy and Sadness, and Bill Hader, (Fear) Lewis Black, (Anger) Mindy Kaling, (Disgust) Diane Lane, (Mom) and Kyle MacLachlan (Dad) all bring their A-game for these performances. Finally, there's Riley. Voiced by newcomer Kaitlyn Dias, pulling off a main character who barely speaks and yet has so many emotions is one of the biggest accomplishments Pixar has had in its rich history. You find yourself coming to care about this character immensely through her emotions, and it leads to one heck of an ugly cry towards the end of the film. Well done, Pixar. Well done. The Critique: An original and captivating premise, Inside Out is easily the most creative and well-executed idea to come out of Pixar in years. The Recommendation: Yes. A must-see for kids, parents, and fans of Pixar alike. The Wind Rises (2013): A look at the life of Jiro Horikoshi, the man who designed Japanese fighter planes during World War II. Okay, so let's start from the beginning. If you don't know who Hayao Miyazaki is, then you're just WRONG! He makes some of the most visually gorgeous movies ever conceived! 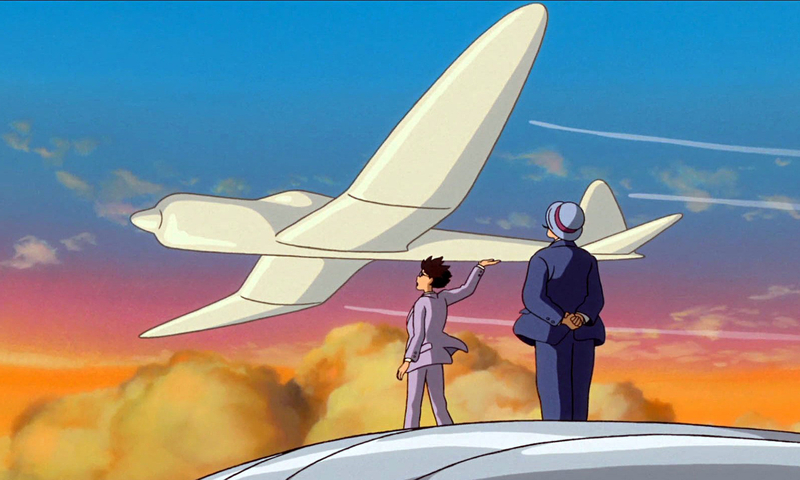 That being said, The Wind Rises is no exception. While most of his movies are highly fantastical in nature, delving into wild adventures on flying magical castles or perhaps trying to save your parents from a witch, The Wind Rises is a much more subdued film that he normally makes. Focusing on a Japanese engineer during WWII, the story chronicles his life from an ordinary student, to the man who eventually went on to design some of the best fighter jets in the world. More importantly it focuses on his relationship with the woman he loves, pulling ever so carefully at those heartstrings. Seriously though,TEARS, TEARS EVERYWHERE! Things to notice, everything flies! Miyazaki has a few themes that he throws into just about every movie: strong female characters, spirits, saving the environment, and without fail flight. This movie is essentially an ode to his obsession with flight...and I'm not complaining. He uses flight to expand our imaginations and reach for the stars! The film is amazing! While it does move a little too slowly for the younger children, and having just a couple ideas they wouldn't understand, it is a brilliant story. The slow pace is balanced out by some dream sequences that keep the attention of the younger audience. Not only is the story amazing, but, like any Miyazaki film, the animation is stunning! Absolutely gorgeous! I would say the film is one of the most subtly beautiful films I have ever seen! The Critique: Miyazaki is just about the most talented animator of all time, and this movie hangs in there with the rest of his films! The Recommendation: While it does move at the slower pace, you catch yourself occasionally wishing everything would go on a bit faster. Aside from the early pacing of the story, the film is amazing and any fan of animation would love it! The Lego Movie (2014): An ordinary LEGO minifigure, mistakenly thought to be the extraordinary MasterBuilder, is recruited to join a quest to stop an evil LEGO tyrant from gluing the universe together. Here's the trailer in case you somehow missed it. So this movie is ridiculous. Absolutely ridiculous. I think ADD would be a great way to describe it. At least for the first two acts, the movie is frantically paced, with a million things happening on screen all at once. However, the movie does slow down in its pacing quite a bit in the third act. Is this a bad thing? No. Absolutely not. It is welcomed actually, as it brings on a few surprisingly emotional moments towards the end of the movie. However the third act is also where this movie lost me. I won't spoil, but I will say a new element is introduced here that I didn't buy at all to bring on these emotional moments. And that will be the difference between me calling this February movie one of the best movies we'll see in 2014 (which many people are already saying) and me just saying that it was....well....really good. It really all depends on whether you buy the big moment of the third act or not. So, let's dive into it shall we? First off, holy crap the voice acting. I was a little worried about this part, as I figured guys like Morgan Freeman, (making fun of every God character he's ever played) Liam Neeson, and Will Ferrel (Lord Business) were just going to use this movie for a paycheck. They didn't. Actually, Liam Neeson specifically puts in a truly remarkable performance with his character, Bad Cop. I figured he of all people would be phoning it in but DAMN! It was possibly the best voice-performance of the movie. And the rest of the cast? Awesome as well. Chris Pratt (Moneyball, Her, Wanted) was fantastic as the lead. (Emmet) He's got a great future ahead of him: he has great comedic timing, he's charming, and he's lovable. Elizabeth Banks, (Wyldstyle) Charlie Day, (Benny) Allison Brie, (Unikitty) Nick Offerman, (Metal Beard) and Will Arnett (Batman) all round out the main cast of the movie. Everyone besides Elizabeth Banks was fantastic. Banks was just...ok. Is that a bad thing? No. I just think she needs more than her voice to create a good character. But that's ok! Then there are the cameos. Since it's Lego and they have made Legos for everything you can possibly imagine, there are a lot A LOT of hilarious cameos. I won't tell you who the cameos are, rather I'll share who voices them. Will Forte, Dave Franco, Cobie Smulders, Jonah Hill, Channing Tatum, Shaq, and others all make appearances here. Some even for just a line or two. Like I'm pretty sure Will Forte has one line. And Smulders. This crew spared no expense with bringing in great actors to do these voices. And we haven't even talked about the animation. Holy crap the animation is some of the best I've ever seen. Some of the opening shots of the city Emmet lives in are absolutely breathtaking. Not only did the crew go all out in making the Lego characters and environments look as realistic as possible, they made virtually the entire movie look like stop-motion animation. As in all of the Legos do not just look like real Legos, they act like real Legos too. THEY ACT LIKE REAL LEGOS. They stick to this formula so loyally that I was 100% convinced that at least part of this movie really was shot with stop-motion animation. Not one second of it was. Not one. And it's 100% loyal to Legos, too. Even when the villains are firing their guns at our heroes, all the bullets look like plastic. When buildings collapse or water gets spilled for whatever reason, it's all composed entirely of Legos. The attention to detail here is amazing. I will say the one time the animation looked a little fake was when our heroes were on the open ocean. They tried creating moving waves out of Legos, and as bold of an idea it was to create choppy seas as opposed to calm ones, they just didn't quite get there. But this is nitpicking at its finest. Seriously, this is right there with Frozen for the best animation I've ever seen. Please make a sequel guys. This movie....it's as much for our age as it is for kids. Actually, that's another thing I'm hearing: the kids are not enjoying this movie as much as the older folks are. It makes sense. The nostalgic moments, or the references to other movies (which were incredibly smart, like animating a train wreck EXACTLY like the big train wreck in 2013's The Lone Ranger is shot) or the final homily the film provides in the third act are all addressed to our generation or to the parents of the kids watching this movie. At the end of this movie it will be the parents crying. And the kids are going to be sitting there like....what? Similar to how the Toy Story franchise keeps it's parents engaged, there will be plenty of that here too. However, I hear that the parents aren't just liking this a little bit more than the kids, they are liking it a LOT more than the kids. In terms of this being a kids movie, it is so rapidly paced in the set-up period that I'm hearing the kids are just not enjoying this movie nearly as much as we are. That and what happens in the third act are the two primary gripes against this film. And again, I'm in the minority in terms of not buying into the third act. I wish I could explain why, but I really can't without spoiling anything. Actually, you know what? Spoiler section at the end. I have to explain this. Anyway, much like Frozen, this is getting my absolute must-see recommendation for anyone who likes movies. While the third act didn't sit right with me, and it will lower my score a lot, if you do buy it, this will very likely be one of the best movies of 2014. If you had a childhood with Legos, or like movies, or have the spirit of a child somewhere inside you, or have actual kids of your own, GO SEE THIS. In 2D. Oh ya almost forgot! I saw it in 3D, and the 3D did not add much. Definitely not enough to warrant the extra money. So, don't waste your money there. You will get just as good a viewing experience in 2D as you would in 3D. BUT GO SEE THIS. NOW. STOP WHAT YOU'RE DOING AND GO WATCH THE LEGO MOVIE. Now to try to get Everything is Awesome out of my head....probably going to be unsuccessful at that. The Critique: a kids movie aimed at our generation/parents, The Lego Movie is full of laughs, excitement, action, spectacular animation, and emotional tension. It's going to be very tough to take this down for at least being the best children's movie of 2014. The Recommendation: unless if you are a soulless, heartless monster, go see this movie. Now. The Verdict: 8/10 Great. If I had bought the third act it would've been flirting with a 10. Just saying. Oscar Talk: That's right, FEBRUARY 2014 OSCAR TALK. This will most certainly be nominated for best animated movie of 2014. It may even sneak into Best Picture too, given how large the field is. Everything is Awesome may also make an appearance into Best Original Song, but probably not. It is a great song though. Now, GO SEE THIS. SPOILER ALERT. BEWARE SPOILERS ARE FORTHCOMING. DID I MENTION SPOILERS? NO. OK. SPOILER ALERT. Monsters University (2013): The 2013 Pixar film is a prequel (of sorts) to the popular 2001 Monsters Inc (yep...12 years ago guys) which has Mike, Sullivan, and Randy, amongst others, all attend college to learn how to become scarers. Obviously, things don't go as planned and thus the story ensues. First of all....damn! It's been 12 years since Monsters Inc came out. Those folks at Disney are geniuses....I grew up with Toy Story as my favorite movie ever, and as Toy Story 3 was about Andy moving to college right at the time when I was going to college, Monsters University has come along right as those who grew up with Monsters Inc are going off to college. What an AMAZING coincidence! Oh, right....movie review. So first off, this movie is freaking gorgeous to look at. It's becoming easier and easier for cheap animation to look good given the advancement of that whole technology thing, but man does Pixar remain 8 steps ahead of the competition. Compared even to another animated movie that came out just this year in Planes, Monsters U makes it look like it was drawn in crayon. The amount of detail in the university's campus and the rooms and the beautiful slow motion animation is just incredible, just to name a few. There's even cinematography elements here! I feel like that's the next step for Pixar animation: being able to freely move a "camera" around in an animated setting. It really blows my mind what Pixar can do. And it's a bit of a jump for me having not seen the last two Pixar movies, so I was REALLY blown away. Here's the problem though: the other thing that Pixar has that so many animation studios struggle with (and live studios for that matter) is being master storytellers. They draw you into a story and make you care so deeply about things that you wouldn't necessarily think that you would care about. For example, Up has everyone crying within the first ten minutes of the film, and I know I cry like a baby every single time I watch Toy Story 3 without fail. And saying bye to Boo in Monsters Inc. Just to name a few.That happens because I legitimately care about the fate of these characters. But it just didn't do it for me in Monsters U. And that's because Mike and Sully in this just aren't as likable as they are in Monsters Inc. And I get it, they learn from their experiences in this one that helps shape their future selves. I get it. But that happens at the end of the movie, not at the beginning. Honestly I cared more about the sidekicks for Mike and Sully than I did them. When their story arc is resolved that was the most touching point of the movie for me, even though it was immediately killed with a really really weird, unnecessary, and out of place relationship/engagement that was created at the very end and very suddenly for some reason between two characters. That specific joke was a huge miss, but there were several great college/young adult jokes in here that were GREAT. Pixar has always done a great job keeping adults entertained in a movie just as much as the kids. Now can I talk about how the source material is massively wasted here? This is far and away my biggest complaint. This did not even remotely feel like a prequel to Monsters Inc. For starters there is a massively wasted story arc here in Randy's character. When he is first introduced I got massively excited thinking oh! We are going to find out why he became so villainous! No. He gets pushed off to the side and is in just a handful of scenes. And he becomes a villain (of sorts) by the end, after starting out as this young and upcoming monster excited to have his chance to become a scarer. MASSIVELY wasted opportunity here. And other than Mike and Sully and a brief cameo from Number 1 with her famous line, there is no one else from Monsters Inc in this movie. Well, the abominable snowman is in this but that's because if John Ratzenberger didn't show up in a Pixar movie all hell would break loose. Like, why couldn't we see the origin of Celia and Mike? Or a story with her at all? Honestly the credits sequence felt more like a prequel than the actual movie. I bring this up because I really hold Pixar in another league when it comes to story telling because they have such a great history of it. I can't help but feel that this one was more of a Disney cash grab. I know it sounds like I'm hating on this movie, but I'm not. And I know its a kids movie. But it's a freaking Pixar kids movie. They are the best at this, and thus I feel I have the right to be a bit more critical of them. But the story is still fun. It made me laugh far more than I thought it would. The voice acting is fantastic (Helen Mirren is BRILLIANT, and Charlie Day....man do I love me some Charlie Day) and the animation is beyond gorgeous. But it just didn't have the knockout punch that other Pixar movies have. And honestly....I'm getting a little worried about this. It's no secret that Disney bought Pixar several years back, and that the last movie that was made before this buyout occurred and thus was 100% Pixar's baby was Toy Story 3. Now in my opinion Toy Story 3 is the best animated film I have ever seen, but since then in the Disney/Pixar era we've had Cars 2, which was universally panned, and Brave, which shared a similar fate. While I will be giving Monsters U a higher score than Rotten Tomatoes has on those two, it is still nowhere near any of the films before that. Which I have seen by the way. The only two Pixar movies I haven't seen are Cars 2 and Brave, in case you were wondering. Fortunately, the future appears bright here, with original content upcoming over the next two years and with Finding Dory the year after that, hopefully this recent trend in Pixar movies will change. I certainly hope so. It still sounds like I'm hating....but I swear I'm not! I'm just being not-very-forgiving. Also this is the longest review I've had to date. Sorry about that. Oh! Positive thing! I LOVE the theme to this movie. So many kids movies have a theme of, just put your mind to it and anything is possible, but this one laughed at the norm. Way to have a bit of a drearier theme guys! Because you know, even if you put your mind to it, you might not be able to achieve your dream. However, you might find something you enjoy just as much along the way. Now that is a GREAT theme for a kids movie. And the theme here, obviously. The Critique: a good but not great Pixar film with many great moments, and without that knockout punch. Still, a fun way to spend 100 minutes.